Sign up to 'Wireless Update', our email newsletter for the latest products, updates & offers. The ENX1 transceiver module offers a 100mW RF output VHF data link in a DIL pin-out and footprint. This makes the ENX1 ideally suited to those low power applications where existing narrow band and wideband transmitters provide insufficient range. A half duplex radio data link can be achieved over a distance up to 10km+ with suitable choice of data rate and antennas. Data bit rate: 3kbps max. Please contact Radiometrix directly or your local distributor for quotations, stock availability and delivery information. The ENR1 is a miniature PCB mounting VHF radio data receiver. It is a narrowband 12.5KHz spacing receiver incorporating a received signal strength indicator (RSSI). It allows the simple implementation of data links at speeds up to 5kbps. 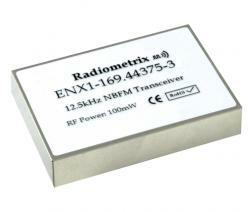 The ENT1 transmitter modules offer a 100mW RF output VHF data link in Radiometrix SIL standard pin-out and footprint.